Whilst checking my basket at the end of a Feel Unique clicking spree and removing any items that answer 'no' to the question, "I want it, but do I really need it?" - which usually ends up relieving a huge wad of cash from my overall total - I noticed that included in the list of products was an 'Exclusive Beauty Bag', and the price? £0.00. Fine by me. After receiving my order in the post a few days later - seriously, their delivery is spot on! - I was taken aback by just how much was in this free gift with purchase. We're talking fourteen hefty deluxe samples worth over £100, housed in the cutest mini packaging. I logged back onto Feel Unique to check the sitch and realised that I had qualified by spending over £100 at the checkout, a number that's easy to reach when you're purchasing high-end products with high-end price tags. Immediately my brain thought 'blog post!' however I was going to wait until I'd trialled all of the samples first - but then I thought, "what'll be the point, the beauty bags will be gone by then!"... so here's a round-up of what's inside - get a move on to bag yourself a bargain if you like what you see, ladies! I love samples as I'm always on the lookout for new products but as I have sensitive skin, it's not always easy to commit to buying the full-size only to find that you don't get on with it and it's not for you. A few of the samples were geared towards anti-aging which at twenty one isn't something I'm overly concerned about but prevention is better than cure, I guess! All of the samples come in a large sparkly blue makeup or wash-bag - it looks a teeny bit cheap but hey, it's free and would come in really handy for travelling. 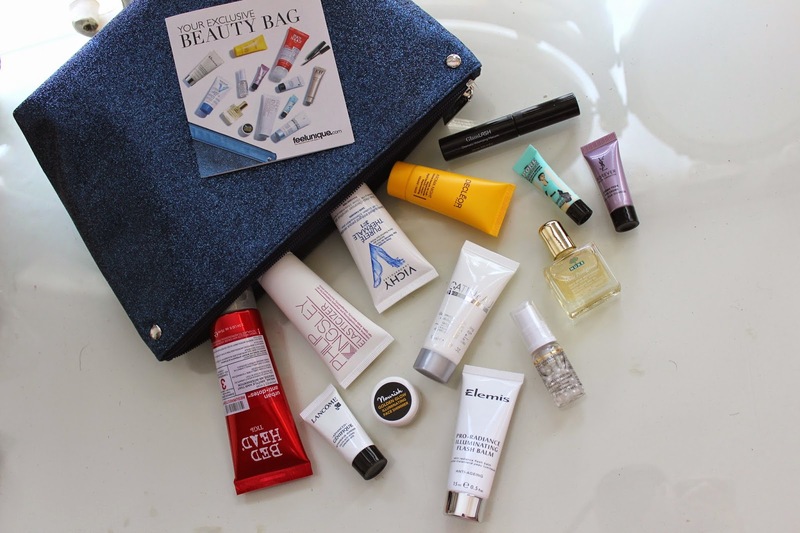 The Beauty Bag also comes with a unique offer of £10 off when you spend £50 or more, and I for one will definitely be making the most of that 20% discount at the end of my next beauty haul. Do you shop at Feel Unique? If there are any samples you'd like to see a review on, do let me know! Please be sure to check the T&Cs on the Feel Unique website before purchasing! Anything free is fine by me, but when they amazing products AND free, well isn't that just the best combination there could be? Feel Unique is such a good website, not only because we are chronic's and it is the most ideal thing ever, but because there is such a good range of products and delivery is always super quick! P.S. Isn't Disqus so much better? Adios spam! Agreed, best combination ever. I barely registered that it was included either so it was the nicest surprise when I opened my package - I won't need to buy eye cream for weeks! Their delivery is incredible, literally just a matter of days! Ah, it's SO good! I wanted to install it months ago but thought I'd wait until I had more time to work on my blog, then I thought 'why not now?' Getting no spam is absolutely amazing when you've put up with hundreds of comments a day, isn't it! Gamechanger.